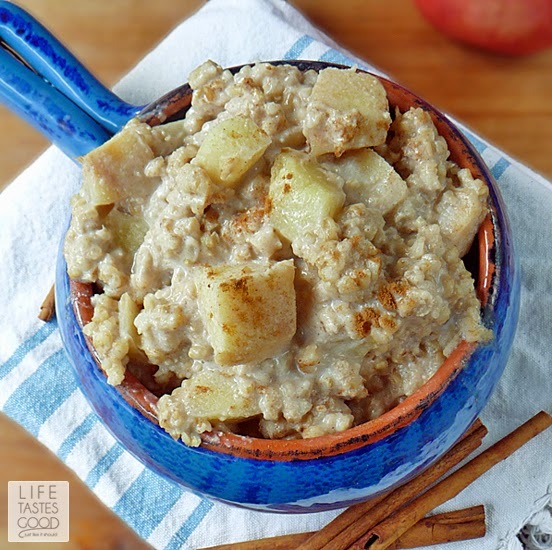 Slow Cooked Apple Pie Oatmeal is a comforting and delicious mix of apples, steel cut oats, milk, cinnamon, and a touch of brown sugar. This oatmeal is cooked in the slow cooker overnight and ready to eat when you wake up to hungry mouths to feed. It is the perfect breakfast for busy mornings, but also great if you have a houseful of guests. Don LOVES oatmeal y'all. Don is a retired firefighter, but when he was on-the-job he would eat a ginormous bowl of oatmeal with some fruit every morning he was on shift. Every morning y'all! Since he retired, he has tried to get me to wake up with him in the wee hours and make him oatmeal. Seriously?! I didn't go to the firehouse and make his oatmeal for him. He did it himself, so why is he all-of-a-sudden incapable of doing this? He claims it's because he doesn't have the time in the mornings when he's trying to get ready and out the door for work. Yes, he's retired, but he took another job. Gotta pay those college bills! My solution to Don's breakfast dilemma is this hearty oatmeal that cooks by itself overnight in the slow cooker, so I can stay comfy and cozy in my bed and sleep to a decent hour every morning! Then when I'm ready to roll out of bed, I can have a bowl of this healthy and hearty oatmeal too! Don and I both enjoy this oatmeal. The apples get a little soft, but not mushy, and the flavor is perfect! Not too sweet! 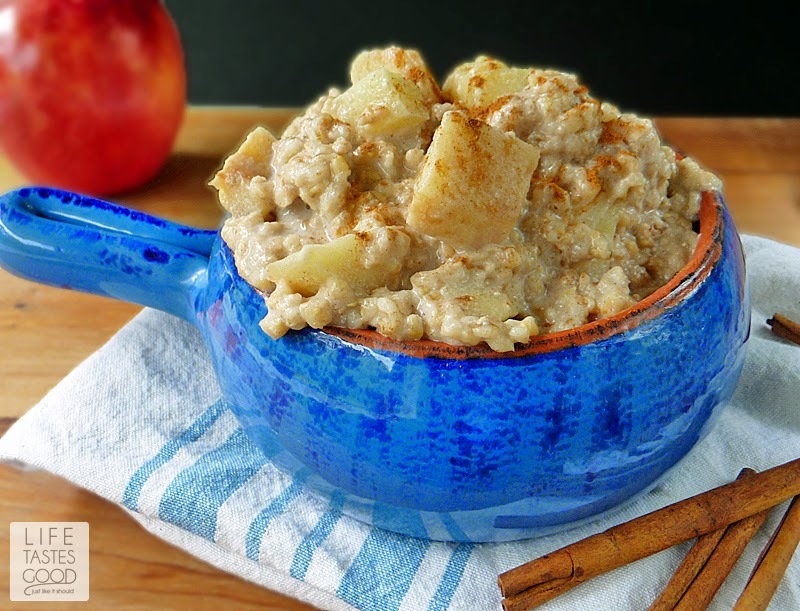 The cinnamon-apple taste paired with the nuttiness of the oats makes for a tasty start to the day! A key component to making this oatmeal is using Steel-Cut Oats. Steel-cut oats take longer to cook than rolled oats and they have a chewier texture, so they work much better in the slow cooker. I personally think steel-cut oats taste better than rolled oats too. You can use regular oats, but they will be mushy with no chew to them at all. This week for #SundaySupper we are celebrating slow-cooked foods to arm you with a whole host of delicious slow-cooker recipes for this busy time of year! Be sure to scroll down to find links to all of our #SundaySupper slow-cooked recipes. 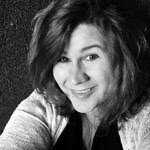 Thank you to our wonderful hosts Heather of Hezzi'D's Books and Cooks and Christie of A Kitchen Hoor's Adventure for all your hard work and compiling all the recipes for us! Place 1 cup steel-cut oats, 1 teaspoon cinnamon, 1/2 teaspoon kosher salt, and 2 tablespoons brown sugar in the slow cooker. Stir to combine. Add 3 cups whole milk and the prepared apples. Stir again to mix well. Put the lid on your slow cooker and cook on low for 3 hours. Turn the temp down to warm and let cook overnight. Sweet dreams! In the morning, give the oatmeal a good stir and a taste. Adjust the flavor as needed. If it is too dry, add WARM milk. If you add cold milk to your hot slow cooker you will crack the bowl of your slow cooker, so be aware of that. Top each serving with a sprinkling of cinnamon and enjoy! Cook time: 6 hrs. 00 mins. Total time: 6 hrs. 5 mins. 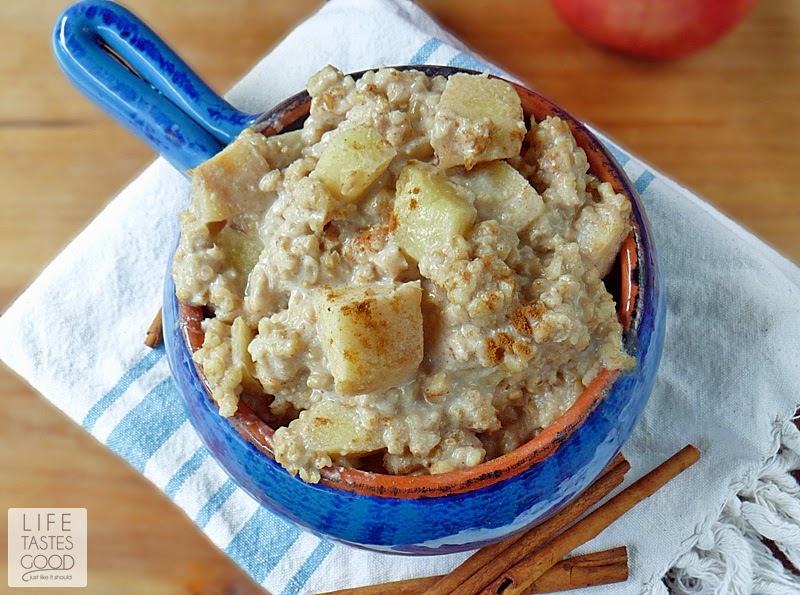 Steel cut oats are quite tasty, and I love how they cook overnight in the slow cooker! Thanks, Kim! This is definitely a tasty way to start the day. And such a great fall breakfast too. Apples and cinnamon! What a delicious way to start the day...and how wonderful to have the aroma of a hot breakfast beckoning you from the kitchen! It was so nice to wake up to that is for sure! Thanks, Liz! I'm always looking for new breakfast ideas and making it in the slowcooker is even better! I hope you like it as much as we do! Thanks! I would love to try this recipe, what a great idea!! Thanks, Tara! My husband asks for this all the time. It's good with pears too! I love a good filling breakfast, esp if I run before work (and am then STARVED all day! ), and this looks like a great idea! It sure saves a lot of time in the mornings, Nichole! Thanks for stopping by! This oatmeal looks perfect too :) I'd probably be more like your mom though and end up adding milk to loosen it up because I like mine a little more thin than thick. I like how easy it is to thin it out. Don likes it even thicker than this, but I just can't do it haha. I add a little milk to mine too. Thanks, Shelby! I didn't have much luck with slow cooker oatmeal the first time I tried it, but yours looks so amazing! I think I'm going to give this recipe a go! Love apples in oats!! Thanks, Amee. I hope you get to give this a try. 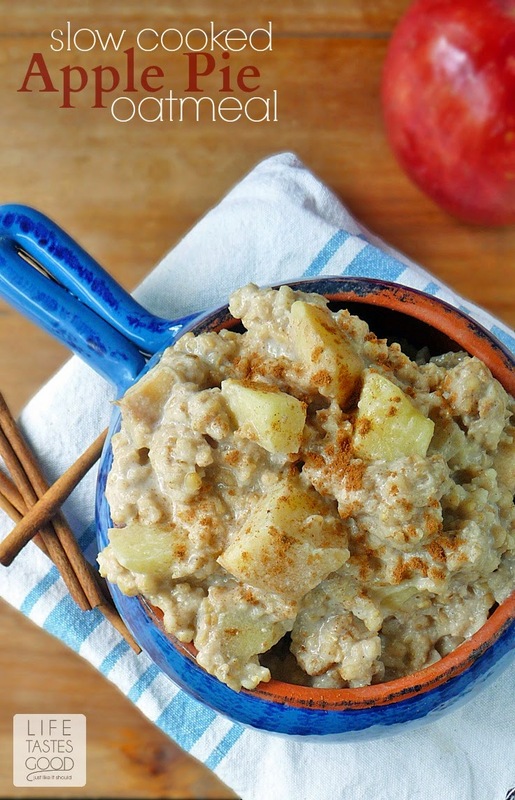 The steel-cut oats really make a difference and the apples, cinnamon and just a little brown sugar really goes nicely together! I have another batch in the slow cooker right now! My husband can't get enough! This looks totally amazing. I love waking up to hot, ready-to-eat oatmeal. I bet it makes the house smell wonderful! Thanks, Kristin! Yes, the house smells so good! It is so nice to wake up to that! Love this recipe so much! I would totally eat it for supper! Thanks for sharing! Thanks, Sheena! Oh yes, I have been known to sneak some bites out of the slow cooker! It would make a delicious dinner! This sounds like some perfect oatmeal! I did not know Don was a retired firefighter. Very cool. Thanks, Renee! I can't believe you didn't know that! He was on the job almost 20 years. He makes me proud :) and how lucky am I to snag a smexy firefighter?!! 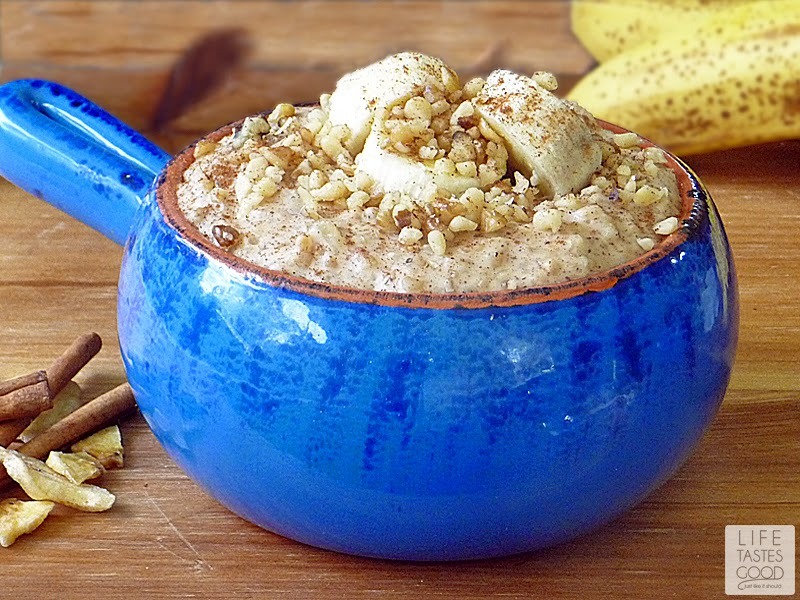 Another great way to enjoy oatmeal.Love it! Thanks, Isabel! When I made this that was my thought! How perfect to have a delicious breakfast already made, so you can spend time enjoying your family! I like my oatmeal chewy too, and I've never tried steel cut oats - gonna have to give your recipe a go! Looks delicious Marion! Is this actually done cooking in three hours and then just keeping warm overnight? I'm leery of leaving the slow cooker on all night long. I made it for Christmas morning and it was great! Thanks! That's wonderful, Jennie! Thanks so much for taking the time to let me know! Happy New Year!! how long can this be left on warm? my kids are late sleepers so I would start this at 10pm and they won't be until at least 8am. Is that too long to be on warm? That's about when I get to it myself, so it should be fine. I usually end up adding a little milk to mine. It still tastes great! I just like it a little more wet, so adding warm milk gets that consistency I like. I hope that helps!